It happens twice or thrice a week. A customer walks into the store with a look of determination on his or her face and asks if we actually sell just bamboo. Now, I have complete appreciation for a customer who knows what they want, but since this is an all-bamboo store, and virtually every item in here is bamboo, I usually just raise my eyebrows in expectation, waiting for a more specific request. Dracaena sanderiana resembles bamboo in appearance, but is actually a hardy houseplant that thrives in water (no soil needed) and requires little or no natural sunlight, making it perfect for offices, bathrooms, and other indoor settings. Its appearance and ultra low-maintenance are probably what earned it the name Lucky Bamboo. But as a member of the family Asparagaceae, this adorable houseplant is actually more closely related to asparagus than than to bamboo. In the Orient, Dracaena sanderiana has long been revered as a great remedy for feng shui and a source of good luck. Maybe it’s the fact that it’s so darned easy to grow. Also, it can be trained and shaped nearly as easily as a balloon animal. 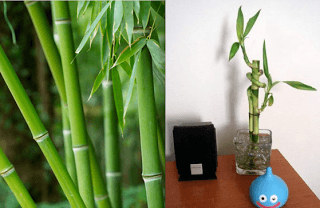 It’s not clear how or when the idea came to be, but today Lucky Bamboo is placed in homes and businesses around the world as a of way of attracting prosperity and good fortune. Another curious fact about this Oriental talisman, the Dracaena sanderiana is actually native to Africa. Although today, when you see markets, florists and boutiques selling Lucky Bamboo, these specimens are almost always imported from China or Taiwan. In many case, the stalks are shaped in to spirals or hearts, and sets in ornamental vases or pots resplendent with fortuitous iconography from the Far East. So yes, in fact, it is quite lucky, but bamboo it’s not. The 1200+ varieties of true bamboo technically belong to the grass family, Poaceae. Among these 1200 or so strains (some say the actual number of bamboo species is closer to 2000), you will discover a great variation of appearance and growth habit. Bamboos do grow all across the globe, from the tropics to the Himalayas, with species indigenous to six continents. Generally, they prefer a lot of water, but there are even a few more drought tolerant varieties. But despite that great diversity, there is a certain characteristic consistency that makes bamboo fairly recognizable. Everyone knows that bamboo grows up in shoots, mostly cylindrical, although there are a few more square-ish strains. The strikingly similarity between bamboos actually makes the different species very difficult to distinguish, particularly for the novice hobbyist gardener. At the same time, there are a handful of look-a-likes, including the Lucky Bamboo, that can be very easily mistaken for true bamboo. Unlike Dracaena sanderiana however, bamboos do share the same general growth habit as all other grasses. That is, they require full or at least partial sun exposure, some type of soil medium, and should most certainly be grown outdoors. Lucky Bamboo, on the other hand, as mentioned above, thrives in dimly lit quarters with nothing but a vase of water. Because Bambu Batu is located indoors, with one large, east-facing window, it’s fairly difficult to keep a true bamboo plant happy and healthy. We generally keep one specimen by the front door, where it gets good sun and plenty of fresh air, but I also rotate it with other potted bamboo specimens from my yard at home, so they are never stuck indoors for too long a stretch. As for the Lucky Bamboo, yes, we do sell it. It is one of the 5 or 6 items at Bambu Batu not actually made from bamboo. LOL. But rest assured, if it’s not genuine bamboo, it’s definitely lucky. Prayers Bundles from our friend Renya are another perfect example; also our eco-friendly, non-paraffin candles made from soy and beeswax. So if you’re feeling lucky, or just needing a little more bamboo in your life, head on down to Bambu Batu. We’re always eager to exchange a few cultivation tips. To learn more about the auspicious uses and legends relating to bamboo, be sure to read our article on Bamboo Symbolism and Mythology.